igus quality assurance - view from inside the box! Wouldn't it be cool if you could recharge a device "on the fly" by shooting a laser from a drone? A multi-divisional team of engineers at Southwest Research Institute is working on it. The project aims to develop an alternative charging method for on-demand power transfer to inaccessible electronic devices, such as sensors along a gas pipeline. In a leap for robot development, the MIT researchers who built a robotic cheetah have now trained it to see and jump over hurdles as it runs -- making this the first four-legged robot to run and jump over obstacles autonomously. In the story of the Marvel Universe superhero known as the Hulk, exposure to gamma radiation transforms scientist Bruce Banner into a far more powerful version of himself. In a study at Berkeley Lab, exposure to alpha-particle radiation has been shown to transform certain thermoelectric materials into far more powerful versions of themselves. Audi has taken a big step forward in the development of sustainable fuels: A pilot plant in Dresden, Germany, has started production of a high-quality synthetic fuel called Audi e-diesel that is made from CO2. Using pneumatic industrial valves for applications in low-temp environments, such as found in transportation applications, can pose special challenges from an OEM perspective. To understand why, Bill Service of Parker Hannifin looks into what goes into a valve manufacturer's thought process in designing a valve that can handle extremes. 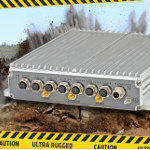 The rugged BC50R from MEN Micro is an IP65-rated, maintenance-free aluminum box computer ideal for data acquisition in extreme environments. All external interfaces, including USB, digital I/O, Gigabit Ethernet, CAN bus and legacy serial I/O, are implemented on rugged M12 connectors for reliable data transmission. The BC50R starts with a powerful, energy-efficient T48N AMD Embedded G-Series APU running at 1.4 GHz. Various CPU/GPU options combine with a wide selection of external interfaces, connected via separate graphics and I/O interface boards, to provide an extremely flexible system quickly tailored to in-vehicle applications for trains, commercial vehicles, mobile machines, and ships. A full line of mounting shaft collars that feature a perfectly square integral mounting clamp and will not mar or damage expensive shafts is available from Stafford Manufacturing. These Component Mounting Collars provide a flat mounting surface with multiple attachment options and are available with or without a flange. 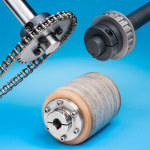 These mounts can be easily repositioned and are suitable for use with a wide range of components, including gears, lever arms, pulleys, and sprockets. 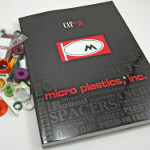 Offered in steel, stainless steel, and aluminum. The Accu-Mount style has a centering hub and comes in one- and two-piece designs. 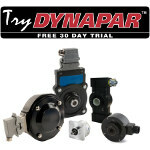 Dynapar is offering a no-cost 30-day beta test trial to all interested and qualified parties for its key product families of incremental and absolute encoders, with thousands of configurations available. Dynapar encoders provide motion feedback control for general factory automation, pulp and paper, primary metals, oil and gas, packaging, beverage, food, pharmaceutical, medical equipment, materials handling, lift and crane, construction operations, off-highway and others, as well as OEM motors. The Megaflux MFH170i from Allied Motion is designed as a rotary actuator ready for use in semiconductor equipment, automated test equipment, scanners, gimbal systems, and similar applications where a complete, precision rotary actuator with a large hollow shaft is needed. The unit is comprised of a high-performance 170 series brushless torque motor, a digital servo drive, and a programmable high-resolution optical encoder -- each integrated into a rugged machined aluminum housing with robust duplex bearings. The MFH0170i series features a 63.5-mm (2.5-in.) 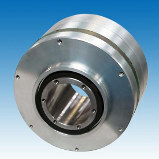 large-bore through shaft and is characterized by a very high torque-to-inertia ratio. There are three stack lengths in the series, with peak torque ranging from 8.5 up to 16.9 Nm (75 up to 150 lb-in.) and rated speed up to 1,000 RPM. The standard winding voltage is 48 V.
U.S. Army engineers have come up with a novel idea for fortifying abandoned masonry, brick, or cinderblock structures: rolls of lightweight ballistic Kevlar wallpaper that can be quickly installed because of the material's adhesive backing. Pop-up guard towers and laser guns for the military are also being refined and deployed. Take a ride down the quality testing line with one of igus' DryLin linear systems as it prepares to ship out of the factory! All igus products are extensively tested in the world's largest laboratory for self-lubricating plain and linear bearings. Take a peek inside the box as our DryLin linear systems pass through igus Quality Assurance. A 12-gram "micro tug" robot created by Stanford researchers moves objects 2,000 times its size on glass (steel objects without wheels or lubrication) enabled by gecko-inspired adhesives. This capability is comparable to a human dragging a blue whale. Even if the human were strong enough, his shoes would slip -- making this feat impossible without something like the micro robot's special sticky footwear.